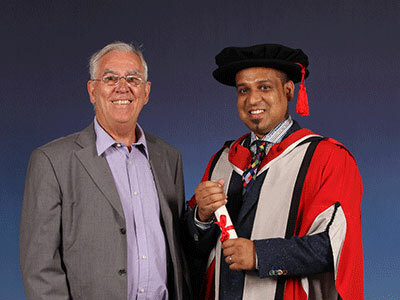 Satish Shewhorak was awarded a PhD from Teesside University after being sponsored through the James Caldwell Scholarship, named in honour of Professor James Caldwell, a former Teesside University Professor who generously gives £2,000 a year to fund a PhD student in the School of Computing, Media & the Arts. Satish is the first person to graduate through the James Caldwell Scholarship and he was delighted that his mentor was in the audience to see him receive his award. He said: 'It was a very proud day for myself and my family and it was fantastic to be able to pick up the award in front of Professor Caldwell, whose support has meant so much. Satish now works as a Senior Lecturer in Games and Animation at Teesside University. His PhD examined the use of computer generated imagery (CGI) to simulate how people of different weights move in order to improve the believability and realism of animated crowd scenes. Professor James Caldwell taught at Teesside University many years ago and has made a commitment to reinvest to support the University and its community. He said: 'Satish is the first person to graduate through my scholarship and it was extremely rewarding to see him cross the stage and collect his award. 'He has been fantastic throughout his studies and I am sure the PhD will help him to go even further in his career. Teesside University offers a range of scholarships and awards to help support students at both undergraduate and postgraduate level.